Do you know how you stand when compared to the competition? If not, you need a quick and easy way to analyze your competition. The SWOT analysis is the ideal tool as it quickly and easily identifies Strengths, Weaknesses, Opportunities and Threats (SWOT). Even though the knowledge identified is at a high level the SWOT analysis enables you to make more informed decisions and increase your chances of success. By improving your understanding and knowledge of the ‘competition’ you have the ability to respond to what you find and conduct detailed research as required. There are four basic steps to using a SWOT and each just requires you to use your own and your teams current knowledge and expertise. The aim of the SWOT is to identify those areas within each quadrant that you require more in-depth knowledge of before you can make decisions. When reviewing your internal factors you look at the expertise and qualities of your organization that are unique. This includes its culture and the resources it has at its disposal. Other items that you should place in the ‘Strengths’ quadrant of your SWOT are the skills or knowledge you have that enables you to add value and gain an edge on others. To complete your analysis of internal factors you have to look at what aspects within your organization remove or dilute your competitive edge or offering. These items make up your ‘Weaknesses’ quadrant. Next you need to identify your external factors. This involves gathering data and assessing the current state of your market place, the economies you operate in and the influence of third parties. You need to make a high level assessment of how potential or anticipated technological, market, global and regulatory changes will have on the operation of your organization. The positive or negative nature of such changes will dictate whether they are classified as ‘Opportunities’ or ‘Threats’, respectively. A current strength may be your patented product, but if this patent is about to expire this is likely to transfer to a threat. This is because your current competitors and potentially other organizations will have access to your expertise. Asking searching questions for each internal and external factor will enable you to highlight those items of your SWOT that are most fragile. Then you can look at matching your strengths so that you are better placed to exploit potential opportunities. Finally, you can assess the possibility of converting a weakness or threat into an opportunity or strength. Where this is not possible you can begin to research and plan your future strategy to ensure your continued success. The opportunity to think outside of what is normally expected within your organization, even if only in a simplistic way is the benefit of a SWOT analysis. It should only be used as an initial guide for defining a strategy or short-term goals. The key to your success in using this tool is in understanding its ‘true’ purpose. It is not intended to provide answers just to highlight key items and issues that need further investigation before answers can be found. To learn more about using the SWOT analysis tool download our free eBook on this topic. As a manager, your role in any strategic planning is likely to involve providing operational data to help assess the internal capabilities, and (depending on your job function) you may also be asked to provide market intelligence. The completion of a SWOT analysis should help you to decide which market segments offer you the best opportunities for success and profitable growth over the life cycle of your product or service. The SWOT analysis is a popular and versatile tool, but it involves a lot of subjective decision making at each stage. It should always be used as a guide rather than as a prescription and it is an iterative process. There is no such thing as a definitive SWOT for any particular organization because the strengths, weaknesses, opportunities, and threats depend to a large extent on the business objective under consideration. Chapter 1 – What is a SWOT Analysis? The SWOT analysis is a business analysis technique that your organization can perform for each of its products, services, and markets when deciding on the best way to achieve future growth. The process involves identifying the strengths and weaknesses of the organization, and opportunities and threats present in the market that it operates in. Chapter 2 – What definitions are needed for a SWOT Analysis? The definitions of strengths, weaknesses, opportunities and threats are open to interpretation and a weakness of the SWOT technique is that it can be highly subjective. For example, if your organization was dependent on one single large distributor then this could be seen as a strength, as you would be able to get your products into the market quickly and efficiently. However, it could also be seen as a weakness because you are totally dependent on them to do so. Chapter 3 – What is a SWOT internal analysis? The internal analysis of your organization should include its culture, expertise, resources, and unique qualities within the market place. The extent to which your organization could adapt to changing circumstances is also a factor that needs to be considered. Chapter 4 – What is a SWOT external analysis? External factors include the environment your organization operates in, its market, ecosystem, and all of the third parties involved. Chapter 5 – What is matching and converting? Matching uses competitive advantage to pair strengths with opportunities. Converting means converting weaknesses or threats to strengths or opportunities. 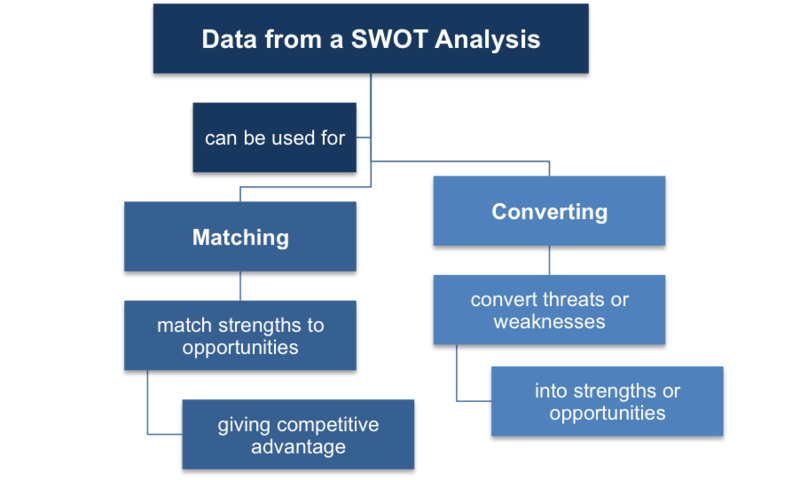 Matching and converting are useful ways of looking at the output from the SWOT analysis but both require a lot of debate and analysis rather than instant answers. Chapter 6 – What are the advantages and disadvantages of a SWOT Analysis? The most obvious limitations are: the risks of oversimplification; the fact that vested interests can prevent weaknesses and threats from being acknowledged; and the danger of information overload as there are no obvious limits as to what is and is not relevant. Chapter 7 – Is there an example of a SWOT Analysis? This example uses the international car manufacturer Audi to illustrate how the SWOT analysis can be applied at the organizational level. It is a well-known and popular example that is frequently used to illustrate SWOT in action. After completing a SWOT analysis, your organization will then use an analysis tool such as the Ansoff Matrix to define the best growth strategy to achieve the chosen objective. If you are unfamiliar with the Ansoff Matrix or want to understand it in greater detail then visit our website and download our free ‘Ansoff Matrix’ business strategy eBook. Today’s organizations find themselves operating in an environment that is changing faster than ever before. The process of analyzing the implications of these changes and modifying the way that the organization reacts to them is known as business strategy. ‘Strategy is the direction and scope of an organization over the long term, which achieves advantage in a changing environment through its configuration of resources and competences’ Johnson et al. (2009). While your role as a manager is unlikely to require you to make decisions at the strategic level, you may be asked to contribute your expertise to meetings where strategic concerns are being discussed. You may also be asked to comment on pilot schemes, presentations, reports, or statistics that will affect future strategy. Our Business Strategy eBooks, templates and checklists will help you to use high level business analysis tools like SWOT, Ansoff’s Matrix and Porter’s Five Forces Analysis. Available in PDF and Kindle format. Click to download our free SWOT Analysis eBook. 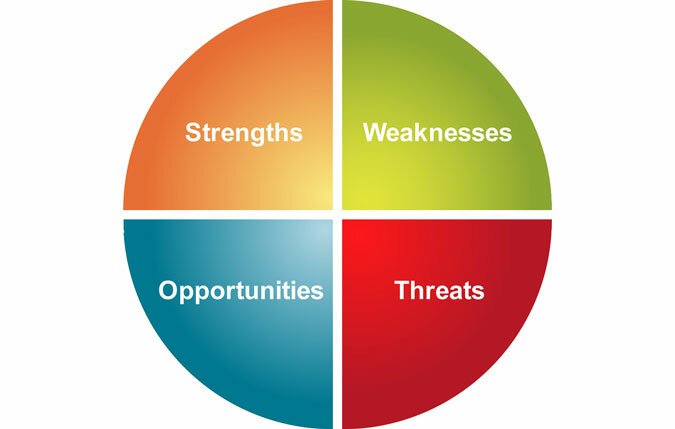 The acronym SWOT stands for Strengths, Weaknesses, Opportunities, and Threats. Strengths and weaknesses are considered to be internal factors over which you have some measure of control. Opportunities and threats are considered to be external factors over which you have no control. SWOTs depend on the business objective under consideration. There is NO definitive SWOT analysis for any organization. SWOT is often the first step in a more complex and in-depth analysis. You may be asked to contribute your expertise to meetings where strategic concerns are being discussed. SWOT can condense a lot of situational factors into a manageable number. SWOT can encourage oversimplification, particularly at the highest level. There are no obvious limits as to what is and is not relevant. Some areas may be difficult to discuss objectively because of vested interests.